Other than being the sell-out of a battle which foretold the shift of conflict from the Spanish-American War to the much-bloodier Philippine-American War, the 1898 Mock Battle of Manila itself was filled with so many sitcom moments that describing it with the word “mock” would be an understatement. For one, there was no need for the Spanish and American forces to stage a fight on that fateful day of August 13 since both their countries had signed an armistice the day before the mock battle. As fate would have it, however, Commodore George Dewey had earlier cut off the underwater telegraph cable linking Manila to Hong Kong and subsequently to the outside world after his proposal to designate the line as neutral was refused by the Spanish Governor General. Hence, the stage was set for the farcical battle. The Mock Battle Still Had Several Killed And Wounded. Although the mock battle—which commenced at 7:30 AM—was carefully pre-planned by the Spanish and Americans to ensure no casualties while giving it the semblance of a real fight, dozens of Spanish soldiers ended up dead with another 100 wounded anyway. On the other hand, six were killed and 92 were wounded on the American side—all thanks to the Filipinos thinking it was a real battle. 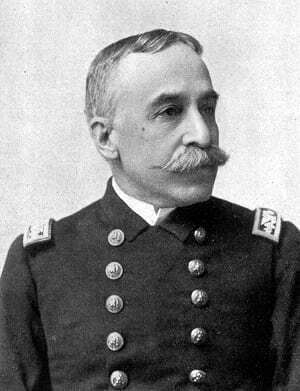 George Dewey. Source: Wikimedia Commons. Due to being left out in the script, the revolutionaries—who were just itching to take Manila after being holed up in the capital’s outskirts for weeks—thought a real battle was taking place and so rushed in to join the Americans. As could be expected, a real pitched battle ensued when the revolutionaries opened fire on a Spanish line, prompting the defenders to fire back at the Filipinos AND the Americans. 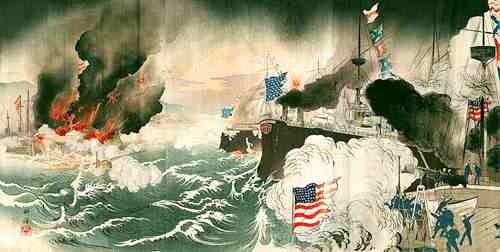 It was not only the Filipinos who were left out; the crew of one American warship—thinking the battle was real—hit Spanish fortified positions several times before finally being ordered by Dewey to redirect their fire to pre-designated safe zones. 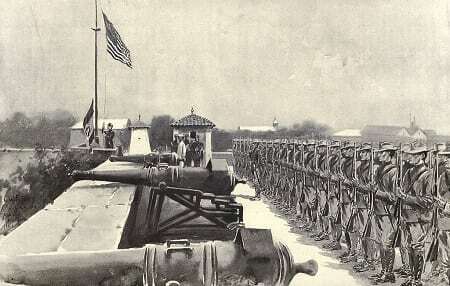 “Raising the American flag over Fort Santiago, Manila, on the evening of August 13, 1898.” drawing from Harper’s Pictorial History of the War with Spain. The charade also had the ignominy of being extended due to Dewey’s failure to see the Spanish white flag of surrender flying over Manila. While the Spanish had flown it according to schedule, Dewey was unable to see the flag from his vantage point in Manila Bay since it blended into the background. Fortunately, the shift in the wind enabled the commodore to finally see it and order a stop to the hostilities at 11:20 AM. At 5:30 PM, the American flag was flying over Manila—an ominous foreboding. 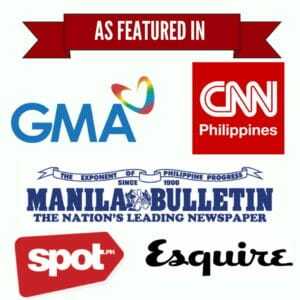 Sterner, D. Victory in the Philippines – The Beginning of a New War. Home of Heroes. Retrieved 13 August 2015.